Okay, who else is obsessed with ABC's Once Upon A Time? Corina and I like to get our fix of season 3 through Hulu, but I've been catching up on the previous seasons through Netflix. Man, the twists on these character's stories are phenomenal! The writers are geniuses. Another thing I love? The fashion! There are several characters that catch my eye with their style. One in particular would be Belle. She's so classy with her bookworm, librarian style, but it's in such an appealing way. Okay, so there was that stint as Lacey, when her character changes and she started wearing slinky sequin dresses and cut out backs. Other than that though, Belle keeps it classy with skirts, cute little jackets, and even cuter heels. I know it may not seem like my own style, but hey, I can still admire it! It makes me want to belt my flared skirts over button downs and toss a blazer over everything. Anyone else watch Once Upon a Time? Who's your favorite character? Any fashionistas that you love on there? I don't watch OUAT, but I might have to start! Those wonderful clothes are also chic, I love your sense of style, Linda:) Thank You for sharing such a nice post! 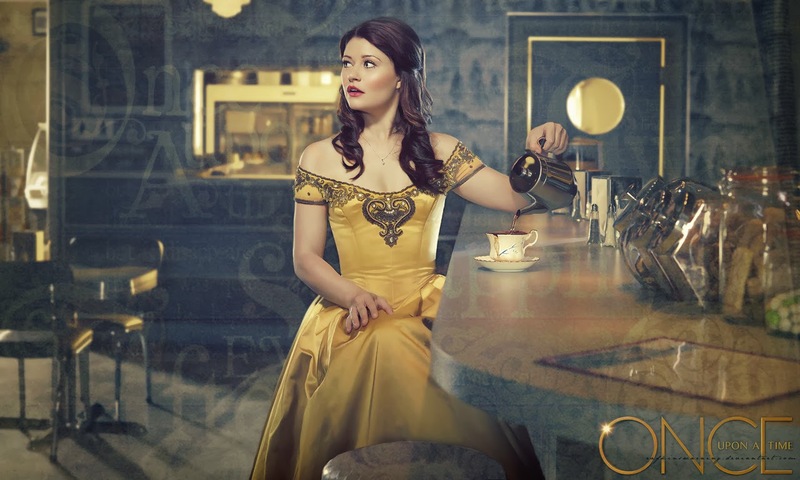 I am an avid fan of Once Upon a Time, and Belle is one of my fave carachters ! Pandora box is my fav! I LOVE this series, its my favorite on tv currently, and the style is really cute as well. Belle has a really interesting character and love the outfit ideas you picked, pandoras box is more my line but that blue dress is so pretty. Thanks for your insightful comment, have a splendid weekend doll! I think it's an awesome show! So whimsical and fairytale, but with a twist. Love that leather skirt. i really adore the second outfit!!! wanna watch Once Upon A Time too!!! I love that show also! I wish I could be in it so I can wear those amazing outfits! You picked out such lovely outfits that I can't decide on one! I used to watch Once Upon a Time! I don't keep up with it anymore, but the fashion was really cute, and those looks are awesome! Well, judging by your outfits here I need to find out more about the show! But Belle was consistently one of my favorite characters on that show. Her and Rumpelstiltskin are adorbs, and she was always so classy. I love the outfit you've put together up here! All of them would be wonderful on you. love the ensembles so much!! Gray and burgundy is one of my favorite color combos right now, so I love that outfit you put together. Also, how amazing is that dress that she's wearing in the first picture? Props to the costume designers for putting a new spin on the classic dress! ooo im waiting for the new season to start on new zealand tv! its an awesome show! I didn't like this show, but I love the photo! Also I love tv and I think my tv style feature is my favorite thing so I am totally into this! Oooh, that library outfit is too cute! I've just started watching the show! I love her style too! I do Love the show! I would actually like to see you do a post like this for each of the lead characters, this one was so fun, it would be really exciting to see more. Hope you have a productive week ahead sweetheart! Linda this is perfect!! It fits Belle's character on the show so beautifully! Love the blue dress- gorgeous.